This kettle is suitable for all heat sources, including induction hobs, AGA and even camping stoves. Great looking kettle, nice loud whistle and fast on the boil, spout cover stays up when flipped, the handle stays nice and cool after boiling, it sits well on the gas hob. Whistling Kettle Stove Top. Details :- Equipped with a whistle. Pepper & salt mils. Capacity: 2,2L. Height: 22 cm. Flat bottom. Made of high qualitymaterials. We will make every attempt possible to resolve the issue if we made a mistake (It happens!). Equipped with a whistle. Whistle is not loud. Pepper & salt mils. Suitable for gas, electric, ceramic, halogen and induction. Browse All Categories. We will make every attempt possible to resolve the issue if we made a mistake (It happens!). 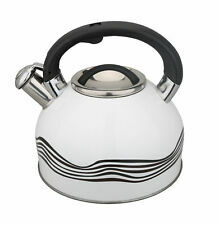 This3 Litre Capacity Stainless Steel Whistling Kettle will add a touch of class to any kitchen. It is suitable for gas, electric or induction hobs and has easy grip, heat resistant handles. Stylish matt kitsch blue soft touch finish. Kitchenaid kettle red. Mod : 5kek1522baco. Condition is used with a small amount of corrosion see pictures. Cash on collection also accepted. Kitchenaid Red Stove Top Kettle 1.9 Litre. Condition is Used. Dispatched with Royal Mail 2nd Class. 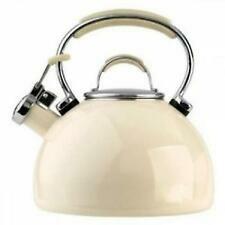 Off White Le Creuset Kettle Traditional Stovetop Enameled Steel 2.1 L. Condition is Used. Pls see slight dent and chip in enamel in pictures. Despatched 2nd Class. 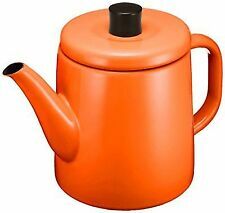 Le Creuset. Whistling Style - Missing the spout Whistler. Ombre Colour Fade. Traditional Kettle. Small Clip to bottom of kettle as shown. Minor Wear and tear around top of kettle. Good Overall Condition. 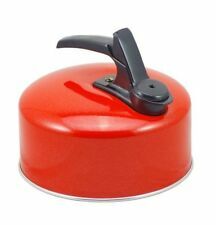 The Prestige 1.4L Stove Top Kettle in Red Features This black hob top kettle can be used on all stove surfaces, from gas, electric to induction! Easy squeeze and pour spout. Kitchenaid Onyx Black Traditional Kettle. Condition is New. Dispatched with eBay delivery – Shutl 2-3 days. Features a stay cool, heat resistant handle and knob, flip top whistle with a stay cool push button to open the spout and clear 'max fill' level markings. Handwash only. Capacity: 2 litres (3.5 pints). Boil dry cut out. Electric Kettle. Product Type Electric Kettle. Electric Kettle Yes. Stovetop Kettle Yes. Rapid Boil Yes. Stovetop Compatibility Electric. Base Material Ceramic. Kitchenaid Cream Bottom Half Kettle 1.5L. Condition is used but working perfectly fine. The classic design sits on your stovetop, and is crafted from heavy gauge porcelain on stainless steel for quick heating. 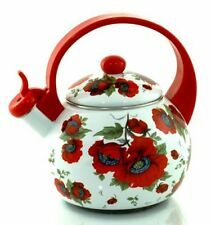 Mariefleur Stovetop Tea Kettle features Wander through a wild garden with Villeroy and Boch, an embrace a whimsical, dreamy dining experience. Beko WKD6306B Specifications. Style: Jug. Power: 3000 Watt. Boil Dry Protection: Yes. Water Gauge: Yes. Rapid Boil: Yes. 360 Degree Connection: Yes. 26.1cm(H) 18cm(W) 21.7cm(D). This whistling kettle in almond incorporates tight fitted lids to retain steam for rapid heating, a lock open spout for easy filling and pouring, and a whistling feature to indidcate when the water has fully boiled. 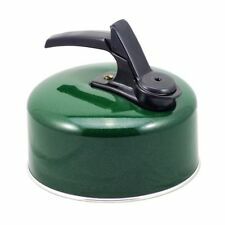 Judge Induction Green Kettle 1.5L Ref: JC85Judge Induction Green Cookware. Induction ready and suitable for ALL hob types. 1.5 litre capacity. All round stainless steel pouring lip. Easy grip comfortable phenolic low heat transmission handles. Whistling Kettle Stove Top. Pepper & salt mils. Details :- Equipped with a whistle. Ending Soon. Capacity: 2,3 L. Suitable for gas, electric, ceramic ,halogen andinduction. Height: 22 cm. Flat bottom. The indented ergonomic shaped handle also ensures safety and comfortable hold. Suitable for all hobs including induction. Flip top whistle and push button to open spout. Suitable for all hobs including induction. KitchenCraft Le'Xpress Induction-Safe Whistling Kettle (2 L) - Midnight Black. With this kettle’s loud whistling spout you’ll always know when the water’s boiled. And when you’re ready to pour, all you have to do is press the button to flip the whistle up and safely out of the way. Cool touch handle Whistles when boiling Dishwasher safe Porcelain enamel exterior for durable, stain resistant colour. It features soft touch handle for ease of grip, comfort and safety. Whistle feature to indicate water has reached boiling point and lock open spout for easy filling and pouring. Tight fitting lid to retain steam for rapid heating. Suitable for all cooker types including induction.. 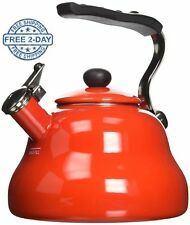 Box Contains 1 x Prestige 2L stove top kettle Kettle has small chip near spout, please see pictures. Please ensure you are aware of this prior to purchasing. Judge Induction Vanilla Kettle 1.5L Ref: JD85Judge Induction Vanilla Cookware. Induction ready and suitable for ALL hob types. 1.5 litre capacity. All round stainless steel pouring lip. Easy grip comfortable phenolic low heat transmission handles. KitchenAid Onyx Black Stove Top Kettle 1.9 Litre Ref: KTEN20SBOBCapacity: 1.9 Litres. Vibrantly coloured porcelain exterior, resist staining, chipping and cracking. Removable stainless steel lid and thumb press spout for easy filling, pouring and cleaning. This almond hob top kettle can be used on all stove surfaces, from camping stoves to the induction hob in the family kitchen! Colour: Almond. Easy squeeze and pour spout. Suitable for use in the oven, on a gas cooker, hob and Aga. Not suitable for use on an induction hob. Delightfully old-fashioned with clean lines and bold colouring, it will stand out beautifully in both a country kitchen and modern townhouse. 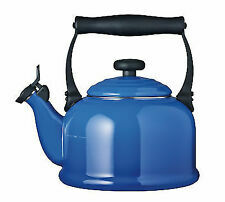 Blue coloured enamel stove kettle - perfect for gas hobs and stoves. This Prestige whistling kettle features a soft touch handle for ease of grip, comfort and safety, a lock open spout for easy filling and pouring. Whistling feature indicates when water is boiled. We'll be glad to help. 1 x Prestige 2L stove top kettle. It features soft touch handle for ease of grip, comfort and safety. Whistle feature to indicate water has reached boiling point and lock open spout for easy filling and pouring. 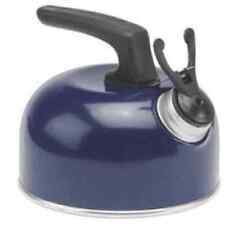 Judge Hob Top Kettle - Unused - (PLT3). These are unused but have been in storage. Does not have Original box. 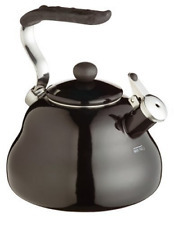 This black hob top kettle can be used on all stove surfaces, from gas, electric to induction! 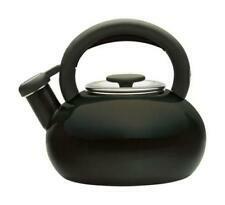 Prestige1.4 Stove Top Kettle in Black. Suitable for all hob top types - Including induction. Easy squeeze and pour spout. 100% Genuine! CHASSEUR 2.5L Enamelled Whistling Kettle Red! RRP $129.00!